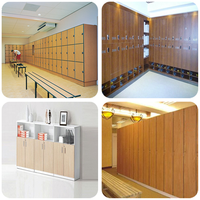 Quality HPL Lockers, Phenolic Resin Lockers Wholesale, Compact Laminates Suppliers - Jiangsu Jiashida Decorative Material Co.,Ltd. 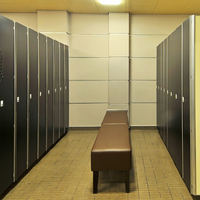 As we all know, public lockers are like public toilet partitions, and we are increasingly inseparable from them. 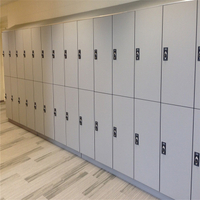 There are many common locker materials, such as metal lockers that are prone to rust, or wooden lockers that are not moisture-proof or fire-resistant. If you want to paint to prevent the locker from rusting? It also cannot withstand the high frequency of people's use. Here, we will list the most common types of phenolic lockers to you. It may be useful to you. 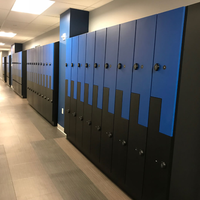 Single Compartment Lockers, Two-Six Tier Compartment Lockers, Phenolic Z Lockers, Executive Employee Lockers, HPL Athletic Lockers, Contour Lockers And So On. HPL Lockers For Changing Room: The modern round room is 60 feet and 6 inches in diameter - the same distance from the pitcher's mound to the home plate. There is a seating area in the middle and an impressive sign on the ceiling.